Visiting any major modern city usually involves finding a creative way to get around. If you choose to rent a vehicle, you may find yourself spending half of your trip stuck in traffic, especially in Bangkok. But if the city doesn’t have a reliable public transportation system, the wait can be even worse. While traffic jams may plague Bangkok’s roadways, when it comes to public transportation, the city is constantly improving its already modern infrastructure. 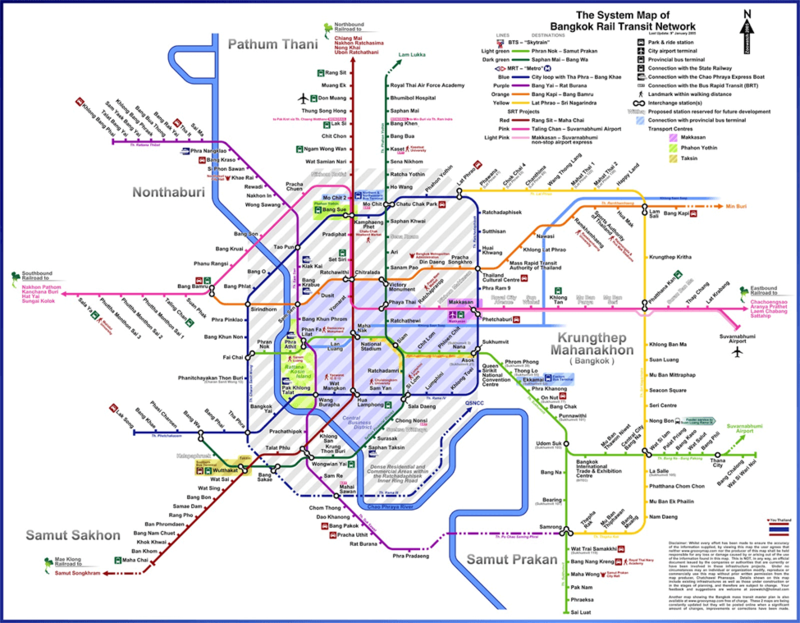 Bangkok has two main transport systems, the underground train and the Skytrain. Both are popular and affordable alternatives to driving or walking for locals and visitors alike looking to get around. With over a million passengers riding the lines each day, the administrators overseeing each line are already executing plans for expansion. Over the next ten years, a number of new lines and stations, as well as additions to current ones, are set to ensure that steady expansion on the systems will keep up with the demands of this sprawling city. The Mass Rapid Transit Authority of Thailand, or MRTA, oversees the Metropolitan Rapid Transit, or MRT, of Bangkok, more commonly known as the underground train. 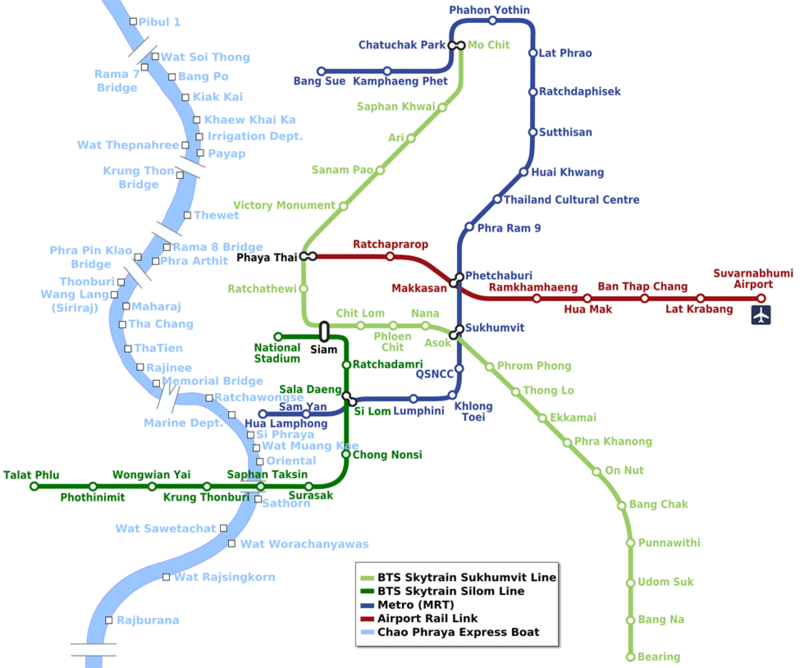 The MRT began operation in 2004, when the Blue Line opened to connect Hua Lamphong to Bang Sue. A second line was added on August 6th of this year, linking Bang Sue to Nonthaburi, named the Purple Line. Nineteen trains currently run on the two lines, which makes wait times at each station less than five minutes during peak hours of operation. The MRT services more than 240,000 people every day. The MRTA has extensive plans for improving its transportation system. They are already working on plans and construction of an additional four lines, and expansions to its original line. 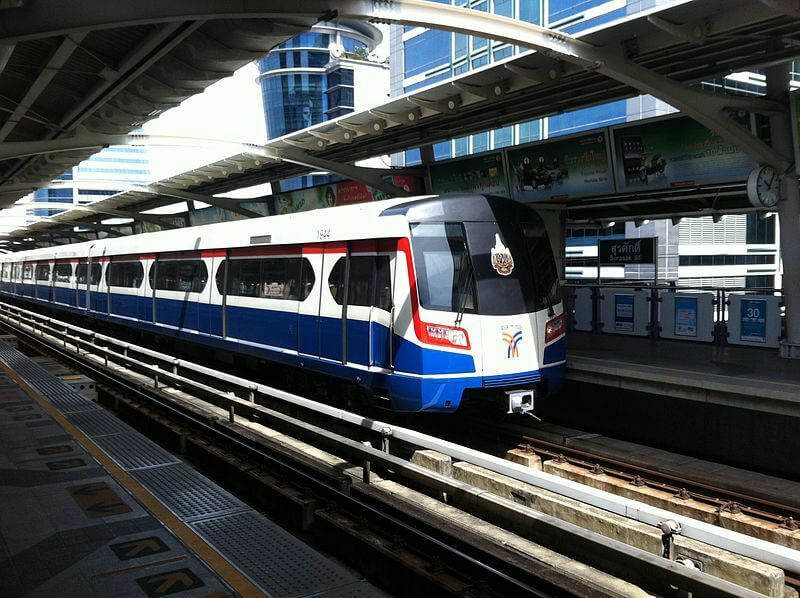 The Blue Line is set to be expanded to form a loop around the centre of Bangkok. The Green Line will be the first of the new routes to open when it begins operation next year. When these expansions are complete, the lines will stretch a total of 91 kilometres across Bangkok. Even while these lines and others are under construction, planning for future extensions is already underway. More popularly referred to as the Skytrain, the Bangkok Mass Transit System is operated by the Bangkok Mass Transit System Public Company Limited, or BTSC. The Skytrain consists of two lines and thirty-four stations around the city. The elevated lines currently cover just over 34 kilometres, and service more than 600,000 people every day, making it Bangkok’s most popular public transportation option. During holidays and other peak-season days, the trains are sometimes so full that they have to depart and leave waiting passengers at stations to wait for the next train. This has prompted extensive plans for expansions to the lines, to take place over the next ten years. The BTSC has plans in the work to expand their lines by more than fifty kilometres by the year 2024. The expansions also include the addition of 51 stations. Right now, a different single-use ticket or pass is needed in order to ride each of the three systems. But soon, passengers will be able to use a single pass, called Mangmoom, to ride the underground train, Skytrain, and the Airport Link. The pass is yet another improvement on the city’s transport systems.